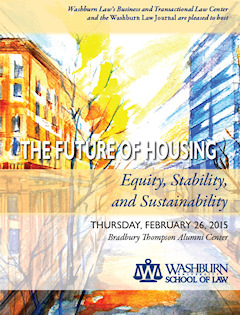 "The Future of Housing - Equity, Stability and Sustainability" will be held Thursday, February 26, 2015, at the Bradbury Thompson Alumni Center at SW 17th Street and SW Jewell Avenue on the Washburn University Campus (map). Free parking is available south and west of Bradbury Thompson. This panel will focus on concepts of equality in housing and issues of intended, as well as unintentional disparate impact of housing policy, law, and trends. Panelists will talk about the current and future trends in the law as it impacts and molds the areas of modern property law. Can Technology Solve the Problem of Complex Consumer Contracts? This panel will address sustainability issues in modern real estate markets and housing in America. Particular focus will be made on the current status and issues moving forward as opposed to cause based evaluations and discussions. Of particular import is the issues of what happens now with issues related to the subsequent fallout from the 2008 crash. How does the legal process and policy adjust and adapt to the outcomes that were simply not contemplated even ten years ago? This panel will focus on the future and new models to sustain housing policy and process in the emerging new housing dynamic markets. Focus will be made on new approaches and contemplations of simple issues like planning, zoning, and environmental law related to new home development and ownership trends. Thought will be given to development of sustainable policy and law in these areas. Registrations for this symposium are no longer being accepted. You are welcome to attend the symposium but we are unable to provide lunch for individuals who have not pre-registered. Washburn Law Journal, volume 54, issue 4 (summer 2015), will be dedicated to the topic of this symposium, and articles written by the participants will be featured. Participants are encouraged, but not required, to submit an article, essay, etc., to take advantage of this opportunity for publication. Authors who cannot attend the symposium, but would like to submit, will also be considered for publication in the Journal. Recent symposium issues of the Washburn Law Journal have focused on Brown v. Board of Education at 60, immigration law, oil and gas law, the rule of law and the war on terrorism (part 1 | part 2), and humanizing legal education. See the Journal's archive for other past issues. Inquiries about publication opportunities in the Washburn Law Journal should be directed to Gabrielle Ilaria, Editor-in-Chief, at gabrielle.ilaria@washburn.edu or (913) 220-3212.